Review by AllTheBestFights.com: 2018-12-08, pretty good fight between Jono Carroll and Guillaume Frenois: it gets three stars. The undefeated Jono Carroll entered this fight with a perfect boxing record of 16-0-0 (3 knockouts) and he is ranked as the No.42 super featherweight in the world. In his last three bouts he has won over John Quigley, Humberto de Santiago and Declan Geraghty. His opponent, Guillaume Frenois, has a record of 46-1-0 (12 knockouts) and he entered as the No.31 in the same weight class. He suffered his only loss when he faced Devis Boschiero in 2013, since then he has won 15 consecutive bouts defeating Michal Dufek in 2018. 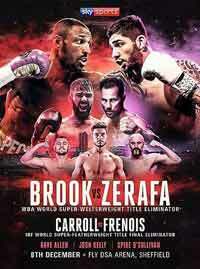 Carroll vs Frenois is on the undercard of Kell Brook vs Michael Zerafa. Watch the video and rate this fight!